Discount dinnerware sets don't necessarily have to be cheap dinnerware. Discounted dinnerware prices can often be found at the end of a season, or after the holidays. Seasonal dinnerware is great for changing décor and brightening up the surroundings. I have so many dinnerware sets that honestly, I could refresh my décor easily from season to season. It's a good way to bring in the season, including spring, summer, autumn, and winter. Holiday dinnerware is also nice for celebrating holidays with your family or friends. Christmas dinnerware sets are a hit as is Thanksgiving dinnerware. Spring dinnerware is perfect for serving Easter dinner and romantic dinnerware sets are enchanting for a Valentine's Day dining experience. The first two reasons are great for buyers, but you may want to use some caution with the other three. Really, it is a personal choice. Sometimes it makes sense to buy a set with damaged pieces. Maybe the set includes more pieces that you will ever use at once. Perhaps you can buy replacement pieces at full price and still get the whole set at a great deal. Dinnerware manufacturers expect their dinnerware to be perfect. If there are slight imperfections, like a bubble in the glaze, a smear in the pattern or a slight variance in coloring, many companies sell the imperfect pieces as factory seconds. Many outlets carry china seconds and sell them at a great discount. The first set of china that I ever bought was found at a seconds outlet in London. 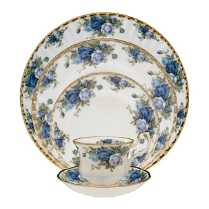 It was a tea set in the Royal Albert Moonlight Rose pattern. I have looked at each piece with a magnifying glass and I can't find any imperfections. I don't know how it ended up at the outlet, but it was a great find for me. I've had it for over 20 years. Now, if a pattern is about to retired, you may have some trouble finding replacements. However, if the deal is really good, you can buy an extra set. With most popular dinnerware patterns, you can find replacements, especially if you put the power of the internet to use for you. 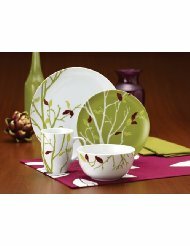 In my opinion, if you like the dinnerware and get a great deal, there is no reason not to buy discount dinnerware sets.